It felt so good to finally open up on Tuesday and share how I've been feeling for most of this year. It's never easy to make yourself vulnerable but the pay-off is so worth it. As part of my effort to try and make things easier on myself I've let go of obsessing about food and my weight, and have been putting in place ways to limit my food choices so I don't have to think about it so much. When I say limit, I don't mean I'm restricting my foods or anything, I'm just trying to make sure that I've got whatever I need on hand when I'm hungry so I can just grab out something and eat and not make a big deal about it. I'm lucky that Dave is such a great cook and has a really good repertoire of meals that he makes. He spends a full day each week cooking multiple meals and freezing them for work during the week. There are always some extra portions of things left over and he's graciously lets me eat them when there is. I find having meals all ready to go in the freezer really helps, as well as having a couple of other things that are quick and easy for the nights when he's not home or there isn't anything in the freezer. 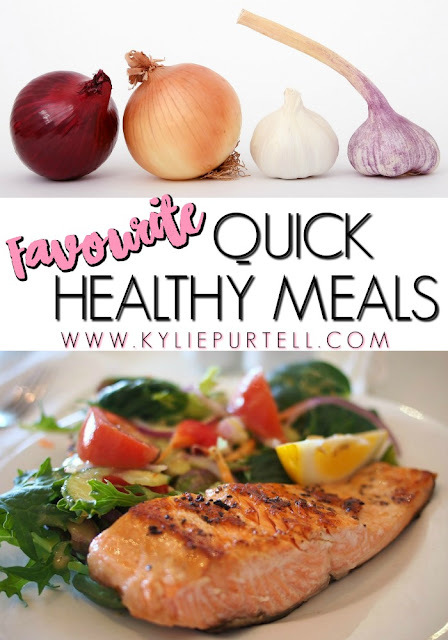 So I thought I'd just quickly share with you some of my favourite quick healthy meals that have really been helping to take the pressure off. By far my favourite quick easy meal is nothing more than BBQ Chicken & Salad. It may sounds like an effort, until you realise that the chicken comes ready cooked from Coles and the salad is also (shock horror!) prepackaged and ready to go from the supermarket as well. Having to stand in the kitchen chopping up salad veggies is not my idea of quick & easy, so I let the supermarket do it for me. Then, all I have to do once I'm ready to eat is take the salad out of the bag, give it a quick wash, and then dress it with my favourite dressing, balsamic vinegar mixed with a little olive oil. The best thing about this is that 1 BBQ chook will make multiple meals. The only effort here is breaking it all down and putting it in to a container. Then once my salad is ready I can just grab some chicken and add it to the salad. I then have enough leftover for another salad the next day, or a sandwich if I've run out of salad stuff. I seriously love salmon, and I'll consume it in any way you present it to me. 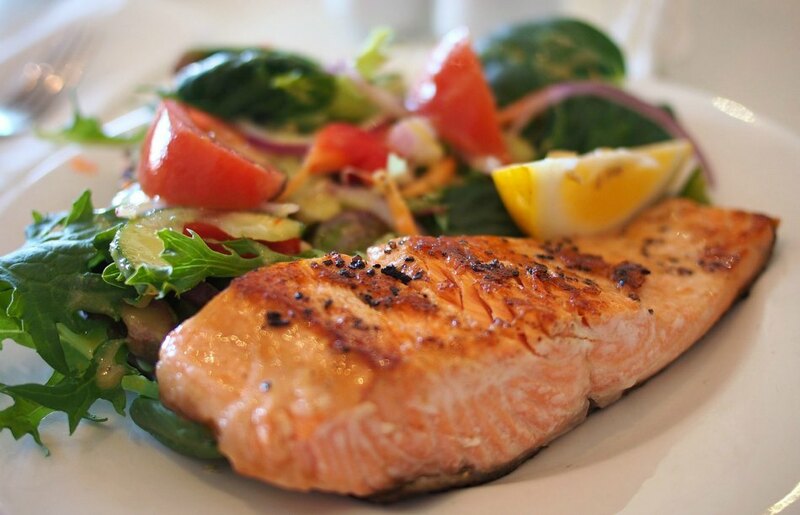 When it comes to quick healthy meals, grilling a bit of salmon and eating it with the above mentioned salad with balsamic dressing is about as quick as it gets! Mine honestly looks as good as this, if not better! This is something that Dave has just added to his line-up of quick meals and they really are tasty. He found the recipe here at Taste.com.au and has made a few slight modifications to it, and often adds his own herbs from our burgeoning herb garden as well. We are yet to get the girls to try these yet, we've talked about possibly shaping them in to fish fingers in the hopes that the girls will give them a try. I'll let you know how that goes! This is probably one of my favourites that Dave makes, albeit with a few modifications made to the original recipe, which you can find here. For starters, we don't have a wok, so he just makes it in a really deep pan, which is perfect because he always cooks a double-batch. He's also tried substituting the chicken breast for mince of all different types and it has worked every time. I think you could make this with most meats and it would still be a delicious meal! Again this is another quick meal that Dave makes and often substitutes lamb for beef. It still tastes great! Dave is a big fan of making recipes that call for mince, and while not all kinds of mince work with all of his mince recipes, you pretty much can't go wrong with either beef or lamb mince in most of them. He found the Lamb & Hokkien Noodle stir-fry recipe here, and there's also 4 other mince recipes on the page. He's also been known to make the Mexi-beans and Rice, just without the ground coriander as he HATES coriander with a burning passion! So there you have it, a few of the quick healthy meals that have been helping me out the last few weeks and making it much easier to stop the obsessing over food and weight. Hopefully you might find a few things here that you'd like to try. 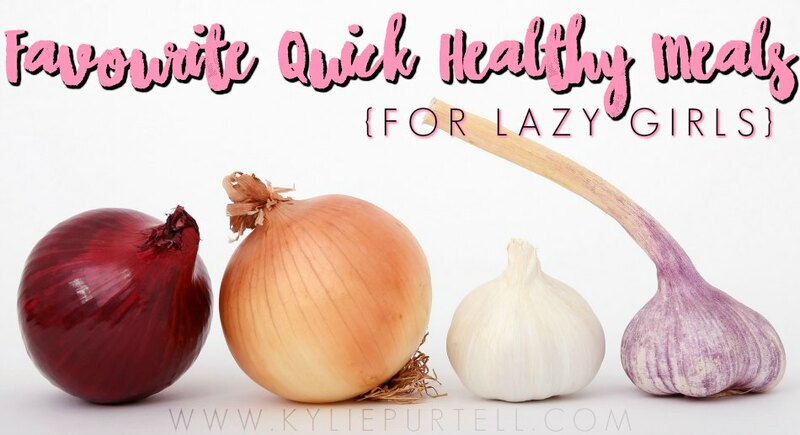 I'd seriously love it if you could leave me some links to some of your favourite quick healthy meals in the comments so we can add a few more to our repertoire!